I have been on this earth for fifty years and spent much of that time watching amphibians and reptiles and wildlife in general, and I have seen my fair share of partly devoured and/or eviscerated frogs and toads. Generally the culprits, such as crows, rats or gulls, will peel off this skin or eat the legs of the amphibian and leave the rest. But tonight, walking along the drive next to my pond, I have found three dead frogs that are all, to a greater or lesser extent, decapitated. Images of two of the three are presented below, for those of a strong constitution. Nothing of the frog apart from its head has been eaten, with the exception of frog 2's left forelimb, which is also missing. I live in a suburban part of Hemel Hempstead, Hertfordshire - and not Transylvania. And no, this is not a late April Fool. Would a domestic cat be so precise? And why just eat the head?? 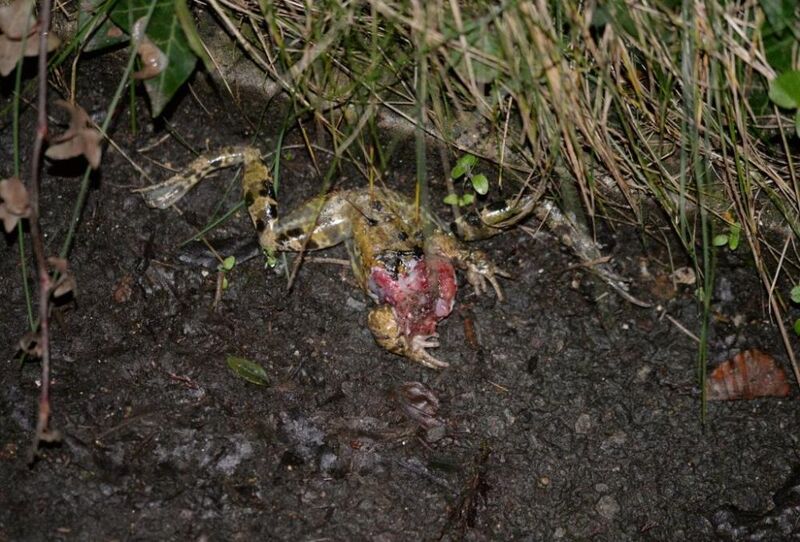 Oh, and just to add to the Frankenstein-like horror, when I prodded frog 1 to get a better look, the hind legs twitched and continued to do so whenever I prodded the poor carcass / creature. Yikes!! PS the wife's just told me it's a cat, and not to be so stupid. So there you go. 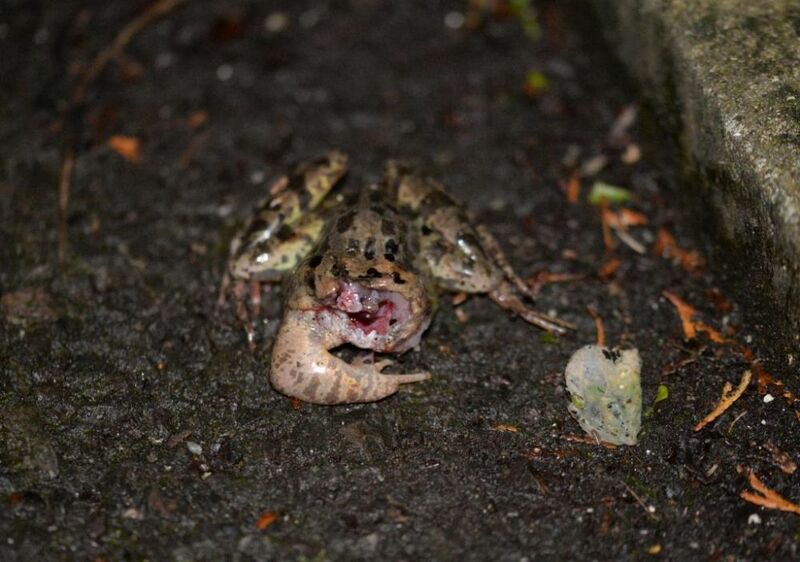 Still..
Would a cat really chomp into a frog? I've seen them catch them but not eat them. They say foxes kill more than they eat - bite heads off chickens but leave the bodies - might it be a fox? According to my better half cats can be expert at beheading mice, leaving the body alone. I guess this particular one has become adept at doing the same for frogs. But it doesn't explain why it gets a kick out of removing the head - it would be crunchy, as you say, Chubsta, but could a cat actually be targeting the (tiny) brain of the frog, for some reason?